You know how sometimes you start to make something with one idea and during the creative process it morphs into something completely different? That is the fun part of sewing for me – when you start with the ‘what if?’ ideas in your head and then go with them to see where it takes you. This is what happened during the making of this jacket. 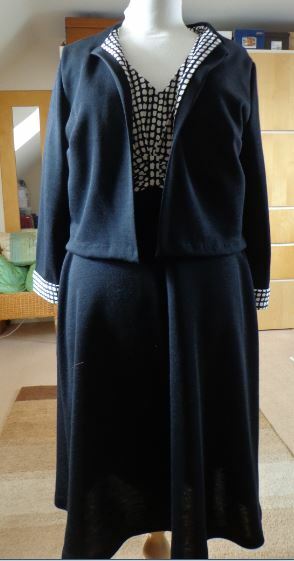 I had some material leftover from making the skirt for my re-fashioned dress and decided to see if I could squeeze out a jacket/cardigan albeit with aforementioned moth hole! 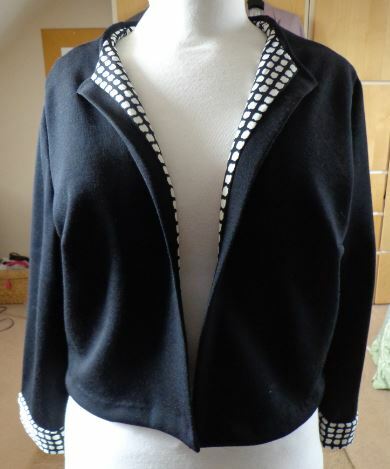 My intention was to make a plain black jacket and perhaps add some braid to ‘liven’ it up a bit. As you may know I hate seams and raw edges etc to show on the inside of my garments and the jacket was really light and quite insubstantial so I decided to line it halfway through the sewing process which is when I had one of those ‘light bulb’ moments and decided to use the discarded skirt material from my refashioned dress. I didn’t have enough to do the sleeves but I could live with that. 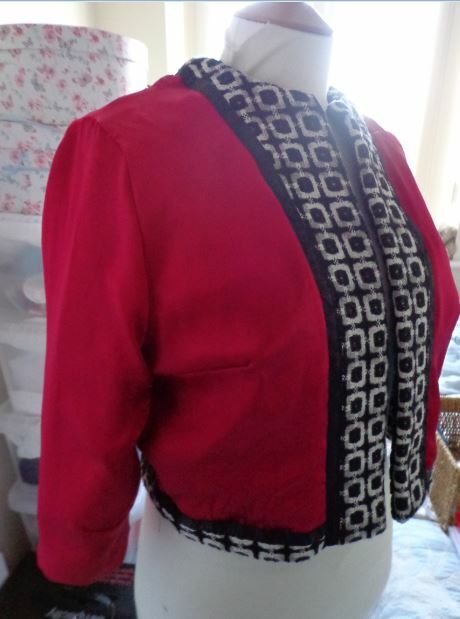 As I was putting in the lining I then saw that if I folded back the jacket front I had a nice contrast which then led me to add some contrasting cuffs in the same material and hey presto before you know it I had a matching jacket for my dress. I have only photographed it on my dummy as I couldn’t bear the thought of another ‘modelling’ session – am I the only one who hates having her photo taken? On another note while I was hand sewing my lining into place I had another thought which was that since doing the Couture Dress class with Susan Khalje through Craftsy I will take any opportunity to hand sew rather than use my machine. I love the control that hand sewing gives you and my favourite stitch of all is fell stitch. I can quite happily sit in my sewing ‘cave’ with Radio 4 on in the background fell stitching my way through the Archers and Gardeners Question Time – I am quite the expert now on the right soil conditions for your azaleas – shame I don’t have a garden to practice in! 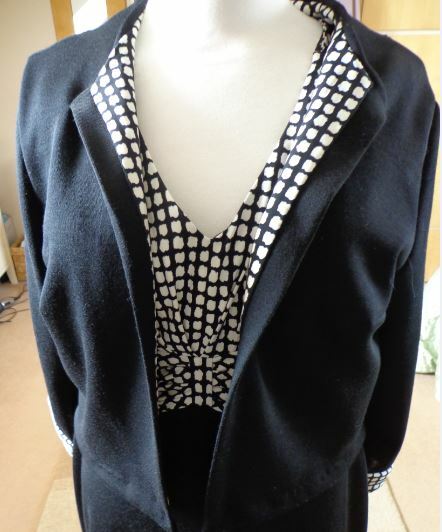 Well it seems that warmer weather may at last be on its way to the UK so contrary mary that I am I decided to finish a winter suit that has been languishing in my UFO pile for quite a while. 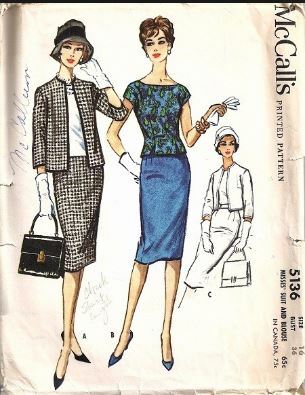 It was my second forage into vintage pattern sewing and I chose this pattern from McCalls. I don’t know why I always get seduced by the covers on vintage patterns as the women look so slim and elegant but the end result is never the same on my more, shall we say, rounded figure? However I always find that vintage patterns tend to be a better fit for me than their modern equivalent which is strange. 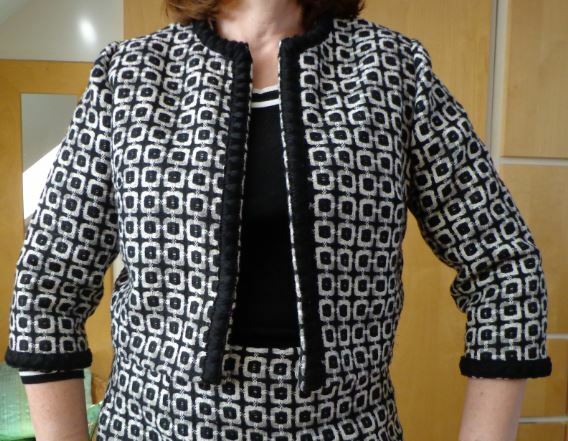 I made the jacket a few months ago – this was intended to be a try out for the pattern and I used some sale fabric from John Lewis which to be honest was probably intended for a coat. I just couldn’t find the right trim to finish this off until I went to Paris. I used the black chanel braid purchased there – I ummed and aaahed about using it on this project as after all it is a long way to Paris if I wanted more. I did make a straight skirt rather than a pencil one from the pattern as my hips will not bear that kind of scrutiny. 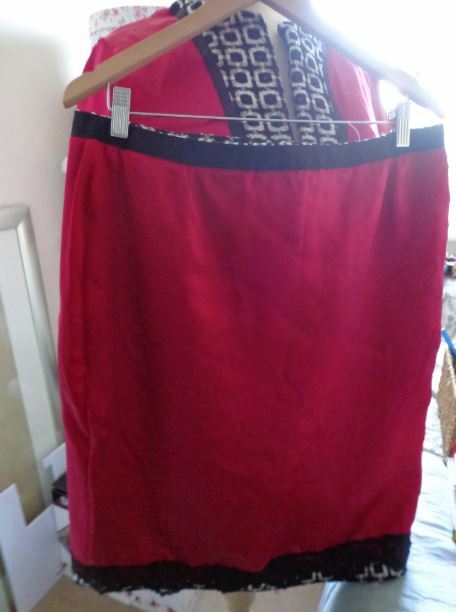 I made a few mistakes on this – one I didn’t match up the pattern very well on the centre back seam of the skirt and secondly I don’t know what possessed me to put a stay lining in the back which only added to the bulk around the collar which is quite horrendous as I also have a facing there. Luckily my hair is shoulder length and hides most of the damage. Third I should have made the sleeves a bit longer. Apart from that it is perfect 🙂 Still we live and learn. Oops skirt is not on straight! Actually I prefer these as separates – the jacket looks nice with my black trousers (there’s a surprise) and the skirt looks really nice with a red jumper so they may end up like sausage and trifle – rarely seen in the same dish unless you are a ‘Come dine with me’ contestant. Actually I prefer the inside anyway but that would be a step too far! I have a lot of stuff, so much stuff that I don’t even know what stuff I have got. It has been weighing me down my stuff. I have cupboards and closets of stuff. Stuff in drawers, stuff in cupboards. I am drowning in stuff. So the Easter weekend was a great opportunity to take charge and sort out my stuff. I am of course referring to the vast amount of clothes I own. I found stuff that I didn’t know I had and it was ridiculous the amount of clothes that had tags on. Anyway I put a great wad on eBay and decided to refashion a few items. I found this Linea dress that was going into the charity pile. I like the top of this dress but the skirt was too long and too full. I thought about ripping the skirt off and taking some of the fullness out and shortening it but had a rethink and pulled out some black wool fabric that I bought from eBay. It is reputedly from Aquascutum and I got it for a bargain price and was really pleased with it. It has a slight stretch across the width which was ideal for my purpose as it meant I might get away without inserting a zip. Anyway to cut a long story short I drafted an A-line skirt from my basic skirt pattern adding a curve to the top of the front, cut it out of the black wool, noticed a moth hole right in the centre of the skirt front I had just cut out! Luckily I had enough fabric to cut out another skirt front which was a shame as I had plans to make a short cardigan out of the remainder. To my absolute amazement the skirt was an exact match to the top – I was expecting a bit of manipulation to match the top to the skirt but they were made for each other so tah rah here is the finished article. I actually have some red shoes which look better than the black but as I was ready for work this morning I popped this little number on and asked Steve to take a photo and couldn’t be bothered to change my tights to match the shoes. I was really pleased with my little refashioning as it only took me a couple of hours. 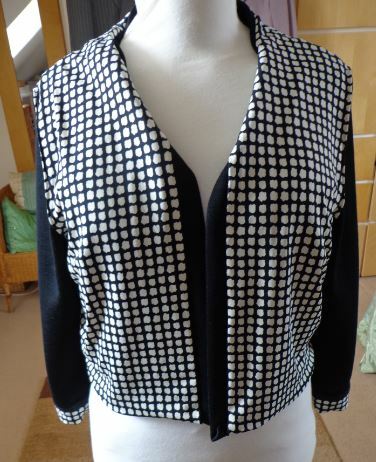 Another bonus was finding a couple of tops to go with the skirts I recently made – please ignore the god awful photo of me – I look so old but then I had a terrible night’s sleep last night – I was awake until 4 in the morning as my brain was wired. So all in all a productive weekend. I had a nice rest, sorted out some stuff, did some sewing and ate an Easter Egg. 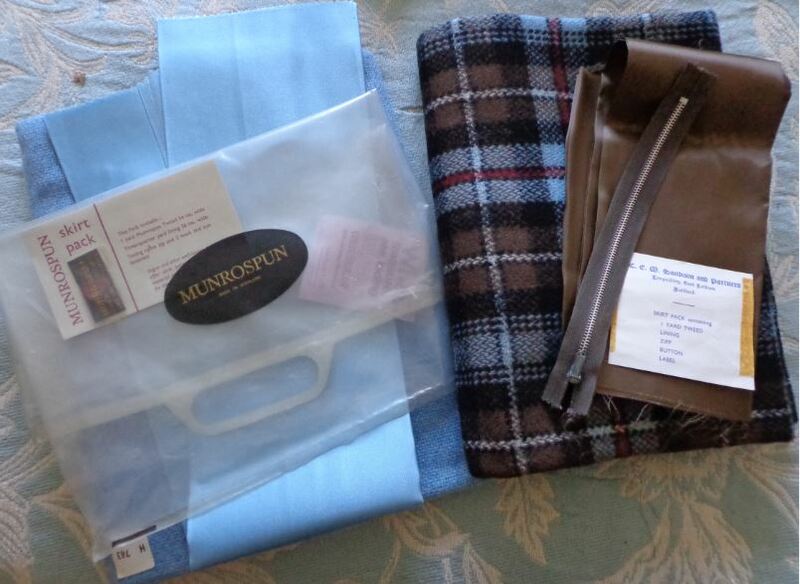 I apologise for the delay in picking a winner for my giveaway but last week I was working in Edinburgh and got home just in time for the Easter holidays but have at last put all the names in the hat and the winner of this lovely wool fabric from Munrospun as seen on the right of this photo is.. GJeometry!! Selected by that old fashioned method of putting names on bits of paper and picking a winner randomly. If you can email me your address GJeometry I will get this in the post to you on condition that you send me a photo of whatever you make from it although probably not much choice given you only have a metre of fabric to play with!